A short novel calls for a short review. No preamble this time. Here it is – my final review for the 1950s! I should be reviewing a novel published in 1959 – but I’m not. I’m zipping back to 1956 to review Patricia Highsmith’s The Talented Mr Ripley. The reason? I unintentionally selected ten books written by men to represent the 1950s. It seemed only fair to add two books written by women to the mix. I’m rather chuffed that I made this decision, otherwise I’d have missed out on reading two amazing novels. The first was Francoise Sagan’s Bonjour Tristesse – and the second is The Talented Mr. Ripley. ‘Wuthering Heights,’ [Holly] said, without hesitation. I couldn’t help but smile to myself when I read this passage, taken from page 59 of Truman Capote’s 1958 novella, Breakfast at Tiffany’s. It’s the echo of a conversation I’ve had myself whenever I’ve mentioned that I’m reviewing Breakfast at Tiffany’s. Oh, I loved that film! Audrey Hepburn was perfect as Holly, wasn’t she? …And then I have to tell the person I’m speaking with that I’m talking about the book, and I’ve never actually seen Breakfast at Tiffany’s, the film. …And then, my interlocutor looks at me as if there’s something drastically wrong with me. Jack Kerouac’s On the Road is not a novel at all. It’s a force of nature; an unstoppable, overwhelming torrent of words. It is a rambling conversation between Jack Kerouac and himself. Written as a stream-of-consciousness autobiography in the guise of fiction, On the Road sees Kerouac cast himself in the role of writer, Sal Paradise. Sal has just recovered from a long illness and split from his former wife when he meets Dean Moriarty. Dean is attractive, intellectual, free-spirited – and Sal is drawn to him instantly. It’s the beginning of Sal’s new life; his life “on the road”. Together, Sal and Dean travel across America, experiencing life in its purest form. Accompanied by an ever-changing cast of assorted characters, they search the country for something that always remains just out of reach, like Dean’s father, whose very absence hangs like a ghost about the very edges of this novel. Over the years of their friendship, Dean’s grip on his sanity slowly deteriorates, and yet Sal’s worship of Dean only grows more fervent. It’s impossible to write about On the Road without addressing the aura that’s built up around it. Just try and find a description of On the Road that doesn’t claim that the novel defined a generation. Yes, it’s quite an apt description – but, at the same time, the legend that surrounds this novel is, essentially, not what On the Road is about at all. At first glance, On the Road is a rejection of the trappings of American life in the late forties and early fifties, an indignant raised middle finger to wholesome, middle class society and all its trappings. It’s so tempting to read On the Road as a hymn to freedom, to the open road and the nomadic life of the eternal wanderer – but On the Road is more than that. It’s as much a novel about a doomed friendship as it is about travel. Sal Paradise is the Sancho Panza to Dean’s mad, staggering Don Quixote. While Dean, for the most part, is having the time of his life, Sal is the hapless one, the devoted follower. On the Road stops short of glorifying Dean Moriarty. As the novel progresses, Dean’s madness begins to wear thin. The life Dean is living isn’t one that can be lived forever. Eventually, we all have to grow up. Even if it means accepting a little defeat; compromising between two very different kinds of sadness. Although I admire the themes, and the dynamic between the two main characters of On the Road, I found this novel incredibly frustrating to read. Kerouac’s stream of consciousness style dwells too much on the mundane. We’re forced to endure pages and pages of drunken conversations, pointless arguments between Dean and his friends; bizarre, half-stoned adventures that do nothing to advance the plot. Sal, devoted narrator that he is, includes every little detail of his travels with Dean with the patience of a saint. Unfortunately, as a reader, I don’t have Sal’s patience. Yes, On the Road can be quite a beautiful novel. But the problem is that Kerouac buries the novel’s beauty between great, useless swathes of text. He uses so many words, and has such agonisingly little to say. 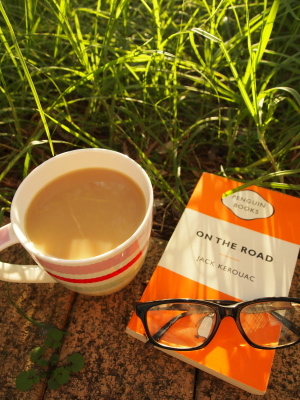 The act of reading On the Road feels rather like being accosted on the street by a wide-eyed stranger, determined to tell you the entire story of their life, whether you like it or not. There’s no space for the reader in On the Road, no room to breathe; no joy. Although the novel is, by definition, a one-sided medium, most authors seem to write with a reader in mind. Not Kerouac. On the Road is not a dialogue with the reader, but a relentless monologue. Perhaps I’m just old and grumpy. But frankly, when it comes to literature, I’ve come to expect so much more than this.